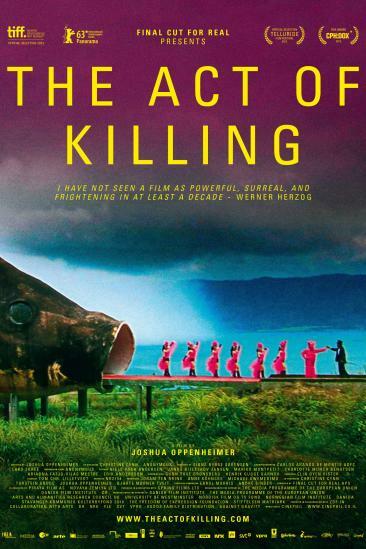 The Act of Killing reenacts genocide whilst providing context to Indonesia's captive state. Oppenheimer didn't just produce a documentary, he created something almost entirely different. In all my years of watching films, I have never seen anything quite as emotively raw as this piece of contemporary filmmaking. Unflinching, uncompromising and unconventional. This is a film about the making of a fictional film, where military executioners obliged to recreate various killings they committed between 1965-66. The individuals acted in it, wrote the script and almost singlehandedly directed it. Oppenheimer disguised his filmmaking qualities to create a documentary that would reveal the monstrosities that took place, and how western governments were also to blame for the deaths of millions. It takes an interesting perspective as we follow Anwar, who eventually invites his colleagues at the time to take part in the "film", star in what is essentially a glorified piece of sensationalistic genre tropes. But, Oppenheimer has a different agenda. Several takes consist of pointing the camera directly at Anwar as he comes to terms with the psychological turmoil that has been buried deep within him all these years. Through thorough explanations of how he killed "communists" and B-movie reenactments, he vividly paints a picture for the audience. The visceral imagery that is conjured up is through his words. We as the audience do not witness any archival footage, it's all up to our imagination. As Anwar proclaims his guilt, we start to question his sincerity. It is conveyed that he is not apologetic for what he did, but how he did it. The cries and blood of the masses that he executed haunt him to this day. And it as that point where we start to see him feel regret and remorse. There is an evocative scene where he decides to act as one of the "communists" by succumbing to a metal wire around the neck. He stops. The film abruptly cuts. We witness him become frail and fragile, overwhelmed by the sudden wave of fear that his victims felt. These reenactments are repeatedly described, by their right-wing peers, as important parts of Indonesia's history. However what Anwar failed to realise was that they acted as psychological therapy. Understanding the victim's mindset during the heinous crimes his military organisation committed. We witness the journey of a glorified executioner, who dances the cha-cha on top of the ground to which he killed hundreds all those years ago, becoming a man who recognises his sins. There's a wonderful quote said towards the end during a village raid that goes something like "you were really good at acting, but you need to stop crying now". That simple sentence meant so much, carrying not just the sentiments of a few individuals, but an entire nation. It's a harrowing world, where millions would rather have dictatorship over democracy. But Oppenheimer's unnerving window into Indonesia, which has sparked backlash from their government, is incredible. Documentary filmmaking has never been this audacious with its techniques, delivering results that will leave many speechless. The more surreal moments, including various drag scenes, do unfortunately feel out of place (despite the gorgeous cinematography) and consequently creates some pacing issues. But seriously, stop what you are doing and watch this immediately. It may just be the best documentary I've ever seen.